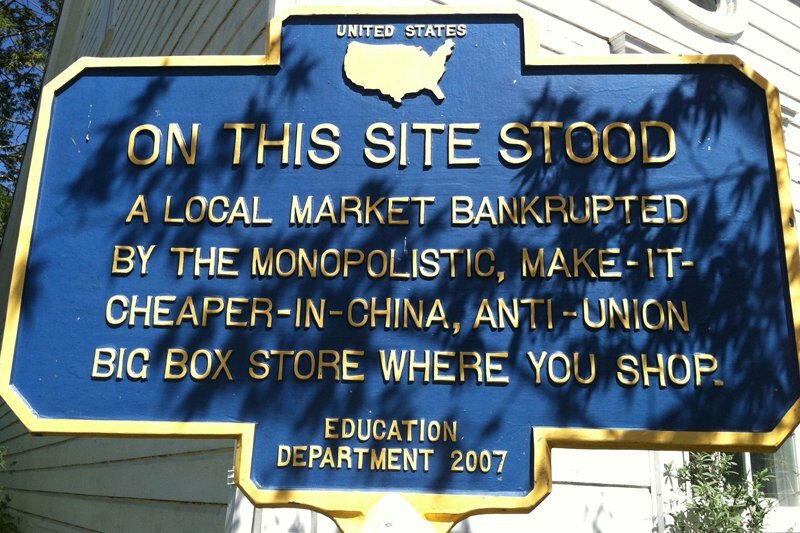 Landmark sign. Anti-establishment attitude. Photos by Anna Balkrishna. The quirky, from-the-land, DIY spirit is alive and well in Woodstock, albeit in a 21st-century guise. Hipsters are the new-age hippies here, peddling hunting jackets and homemade soap, looking for fresh air, peace, quiet, and a proper (seasonal, sustainable) dinner to top it all off. 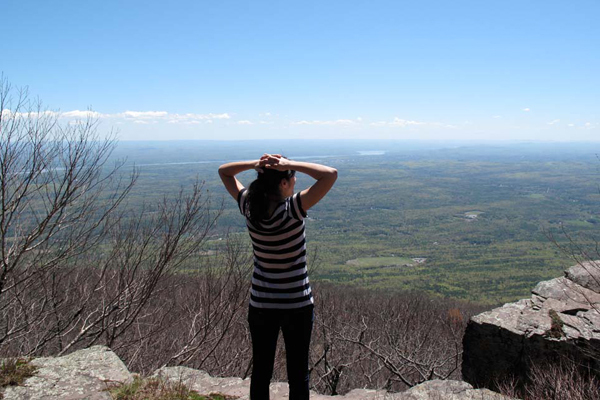 Fathom contributor Anna Balkrishna tells it on a mountain. CATSKILL MOUNTAINS, New York – You know you're a New Yorker when you measure your love for the city by how easily you can escape it in two hours or less. So when the Boyfriend gave us the assignment to skip town after work on Friday, I immediately suggested Woodstock (two hours and eight minutes away, according to Google Maps). The little Catskills hamlet has everything we love in a weekend getaway: the great outdoors, great food, and just enough local weirdos to keep things interesting. If you look past the tie-dye emporiums and energy healers, though, Woodstock has its own laid-back sense of style. Evolve Design Gallery stocks a small but impeccable array of Scandinavian home furnishings, like sleek birch tea trays and textiles. Woodstock General Supply has high-end sportswear that would look just dandy on the streets of Soho — on our last trip, the BF had his eye a beautiful waxed Fjällräven field jacket that was marked 50 percent off. Reward yourself for your efforts with a salted caramel pretzel cone from Taco Juan's, the only Mexican restaurant I know that's famous for ice cream instead of tacos. The scene at Taco Juan's. 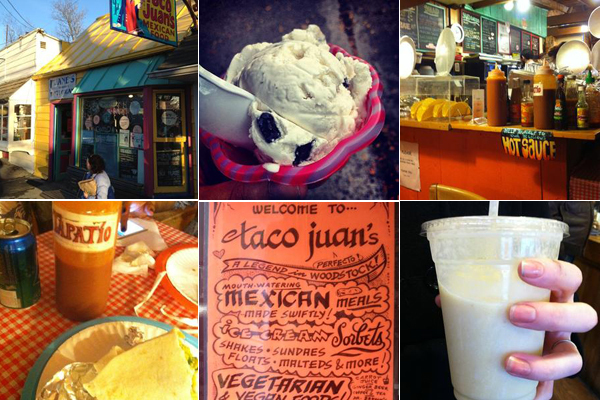 Photos courtesy of Taco Juan's. Woodstock is located in the midst of Catskill State Park, which means opportunities abound for wearing yoga pants in natural splendor. If you only have one afternoon, drive up Rock City Road to reach a 2.4-mile gravel hiking trail up to the top of Overlook Mountain. I found the ascent "challenging," but resolved to finish once I saw little kids passing me, and was soon glad I stuck it out. 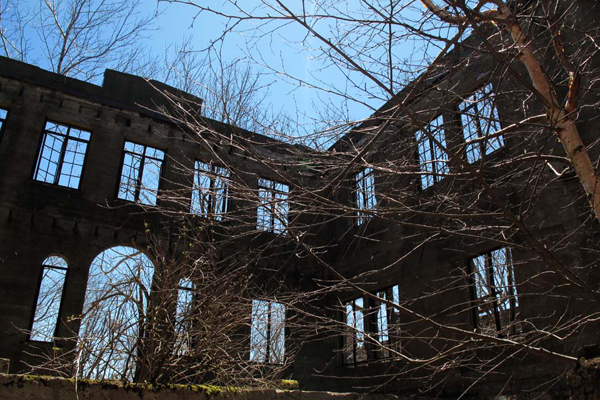 At the 2-mile mark, we came upon the burned-out ruin of an old building: The Overlook Mountain Hotel, which was built in 1871 and endured the usual series of fires and reconstructions until it finally succumbed for good in the ‘60s. The remaining stairways and fireplaces, slowly crumbling under the growth of trees, are the best kind of spooky. Just a little further up the trail, you'll be rewarded with a breathtaking panoramic view of the Hudson Valley and the Ashokan Reservoir. Beware of falling rocks and couples getting engaged at the lookout point. Spooky remains of The Overlook Mountain Hotel. If you know me, then you know that the BF and I like to strike out on our own when staying in small towns — you can find good deals on cottages like this one on AirBnB. Another cool alternative is the Aspects Inn & Spa, a renovated 1910 colonial house that's been transformed into two private apartments for guests. The downstairs apartment leads directly onto the spa: an airy, light-filled space equipped with hot tubs, saunas, and a 40-foot indoor pool. You can book a massage during your stay; since this is Woodstock, your dogs are welcome to join you. If you have access to an open flame, nothing beats picking up a couple steaks from the excellent Woodstock Meats, along with local organic produce from Sunflower market next door. But if you must eat out, there are plenty of super-fresh cafes to pick from. We gravitated towards the Landau Grill, as much for their outdoor patio seating and dirty martinis as for menu items like the "New Age" Cobb salad (grilled tofu and peppers replace the chicken and bacon) right next to a host of BBQ options. Hands down, though, the must-eat meal in Woodstock is dinner at Bear Cafe. The restaurant is a romantic space that includes outdoor deck seating next to a lovely creek. Bear Café's twists on New American cuisine — grapes in the kale salad, grilled salmon atop delicate coconut curry — are inventive and worth the visit. It's just an added bonus that you might spy any number of famous faces at dinner; when we were there, we snuck peeks at Helena Christensen (she's still gorgeous, in case you were wondering) and some original members of Steely Dan (they're, uh… less so). Clearly, there's room for all of us in Woodstock. Anna lives and works in Brooklyn, where she is an associate editorial director at HUGE Inc. She travels for the clean hotel sheets.